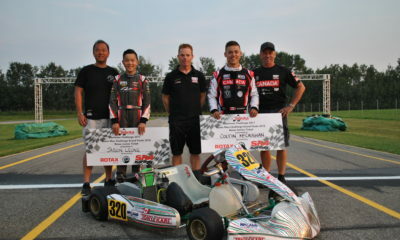 WCKC Rotax Max Report: McCaughan, Dowler, Allan, Kwong and LaRoque Prevail – CKN | CanadianKartingNews.com | Because Karting is a way of Life! 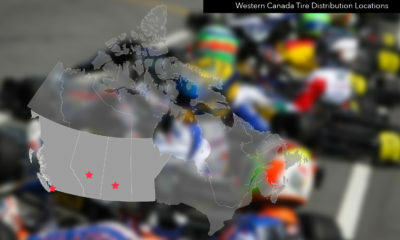 Round one is in the books for the Western Canadian Karting Championship. Taking to the track in Strathmore, Alberta, 148 entries rolled into Northstar Raceway and put forth their best efforts to drive home with a victory in a number of categories. After two days of racing and some great competition on the track, a few drivers have asserted themselves as championship favourites, but with two rounds left to race, nothing is for certain. 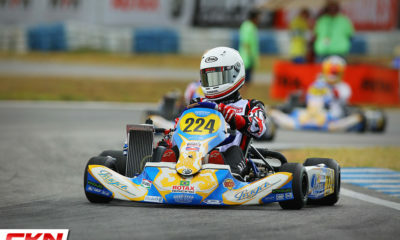 Here is our WCKC Rotax Max Report. With a little less pressure on his shoulders, Coltin McCaughan (SodiKart) prevailed throughout the weekend at the WCKC season opener, scoring both victories in Senior Max. 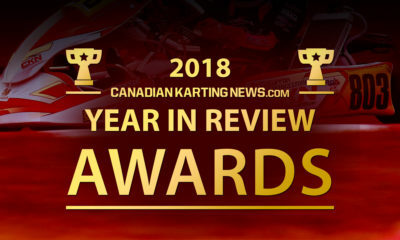 Already qualified for the Rotax Max Challenge Grand Finals, McCaughan is racing for victories and to simply to prepare for the big event, which takes place in Brazil this November, while his rival’s race to join him on Team Canada. 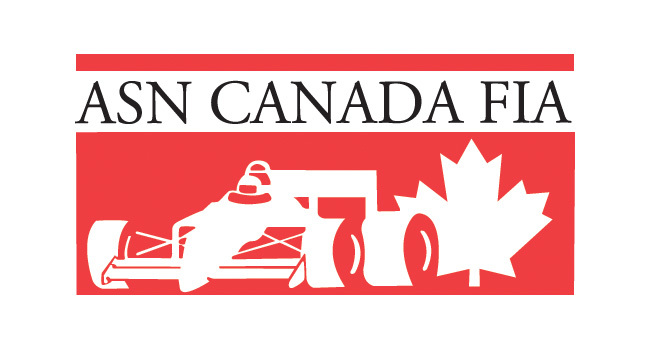 The victories weren’t easy for McCaughan, as a number of competitors put the pressure on the driver from Alberta from start to finish. 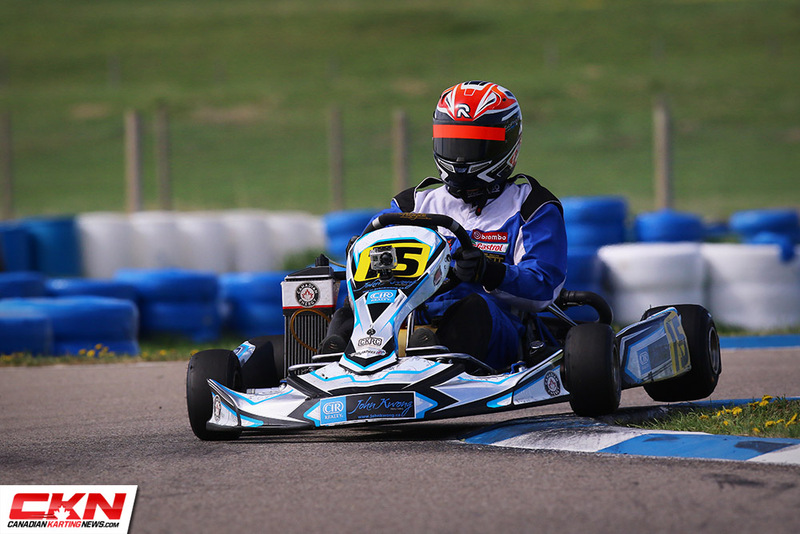 After McCaughan qualified on the pole-position Saturday, he was overtaken in the PreFinal by Garret Britton (BirelART), who went on to win ahead of McCaughan and Jake Thompson (Exprit). The Final saw Thompson push Britton to the lead up the hill through turn one. A few corners later, Thompson took the lead and was followed closely by McCaughan to close out lap one. 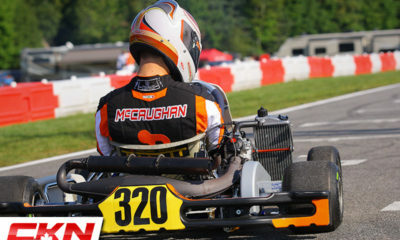 McCaughan made his move early and dove to the lead in turn four on lap two, but Thompson stayed right with him for a few laps until a small mistake in the tight hairpin allowed McCaughan to open up a gap. That was all he needed as McCaughan would pull out to 2-second victory. 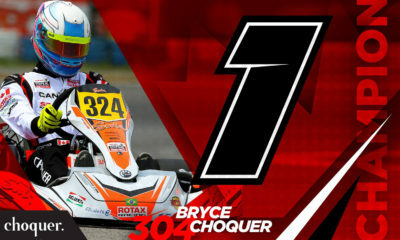 Thompson just barely held off Britton for third while Bryce Choquer (TonyKart) moved up a couple spots to finish fourth, just ahead of Skylar Dunning (TonyKart). It was the same three up front on Sunday until some bad luck caught Britton out on the final lap of the PreFinal. While running third, Britton slowly came to a halt as he approached the final corner. The culprit: a lost chain. Leading the field to green, McCaughan and Thompson shared the front row with Thompson getting the better advantage at the start. He would lead the opening five laps until the pressure from Choquer and McCaughan was too much. On the same lap, Choquer took the lead in corner two and McCaughan slipped by Thompson in corner four and with Thompson unable to keep up with the leaders, the race came down to two. Choquer would lead until two to go when McCaughan slid up the inside of turn two to lead for the first time in the Final. From there, he wouldn’t relinquish it, all the way to the checkers as the former CKN Brand Ambassador completed the weekend sweep with a sweet celebration. Choquer came home second, with Thompson holding off Bradley Dezall (Kosmic) and Noel Dowler (CRG) for the final podium position. 05/29/2018: Editors note: We have removed our point about the CKRC club racers using different tires. 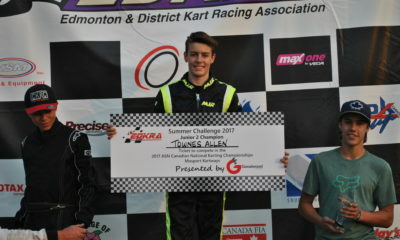 The Rotax Junior victories were split between Griffin Dowler and Townes Allan as the two declared their intentions of winning the championship with excellent performances in Strathmore. So, in the race for victory, Dowler (TonyKart), Kevin Foster (TonyKart) and Cooper Becklin (BirelART) broke free from the chasing pack after Allan found trouble on lap two and went down a lap early on. Andrew Maciel (Ricciardo) was also in the mix early, but couldn’t quite keep up as the laps clicked away. Dowler controlled the pace for most of the race and although Foster was able to get into the lead for a lap, it didn’t last long. At the checkered flag, it was Dowler ahead of Becklin and Foster. 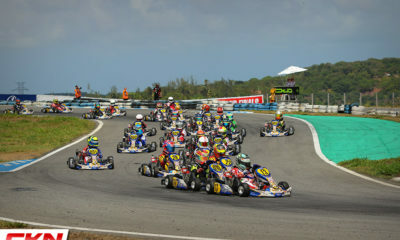 Sunday featured another three-kart race for the win, with Allan jumping into the mix and Foster unable to stick with the leaders. Back and forth Allan and Dowler exchanged the lead early while Becklin held station in third, waiting for a chance to pounce. Unfortunately, that chance never came for Becklin as Allan went to the lead just before halfway and was able to hold just over a kart length lead over Dowler for the remainder of the race en route to the win, a great comeback from the day prior. 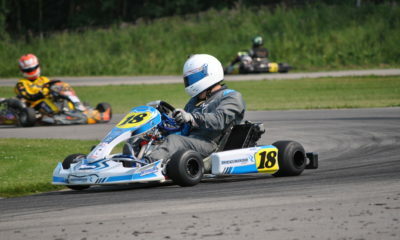 Second went to Dowler, who hauled the greatest number of points over the weekend, with Becklin taking third. 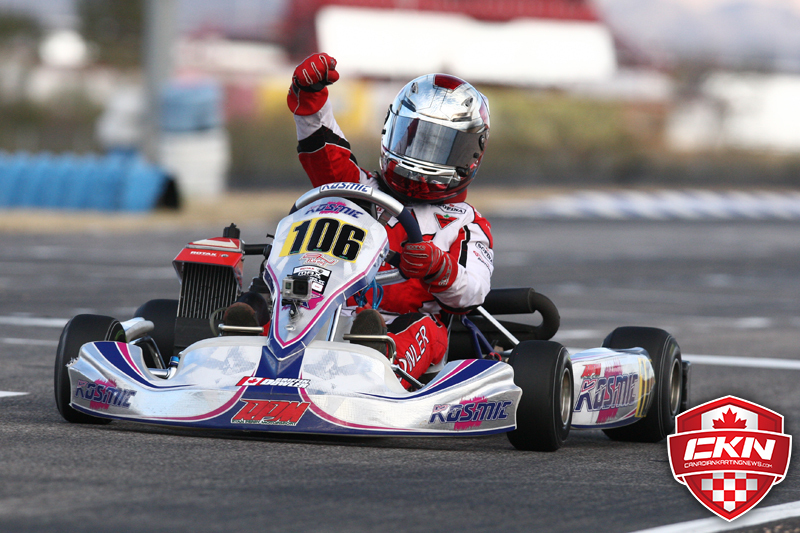 The 2016 Rotax Grand Finals Micro-Max Champion proved his credentials over the weekend as Diego LaRoque (PDB) went undefeated in Mini-Max competition. LaRoque, from Phoenix, Arizona, acted as a rabbit for the rest of the field on Saturday and Sunday, winning by 8.4 seconds in Final 1 and 11 seconds in Final 2. 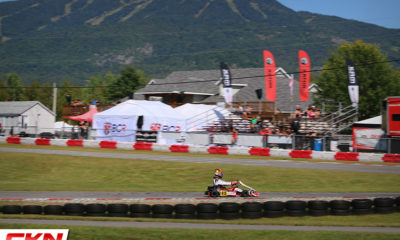 In the races for second place, Max Pankewitz (TonyKart) just barely held off Keiren Hartley (BENIK) on Saturday, as the two matched each other pace lap after lap in the Final. On Sunday, Hartley kept close to LaRoque in the opening laps, but couldn’t match the leader’s consistency and by the final laps had been caught by Antonio Constantino (Atomica). Not only would Constantino find a way by Hartley, so did Pankewitz before the checkered flag, earning both a trip to the podium. 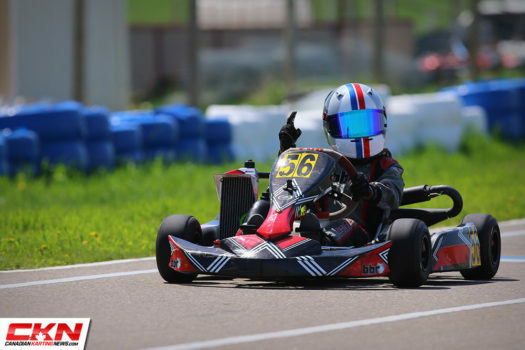 As the lone driver in Rotax Micro-Max this weekend, Sydney Cassel used the WCKC event to gain valuable experience for the rookie. John Kwong (Praga) was a man on a mission this weekend, competing in three different categories at the WCKC event. 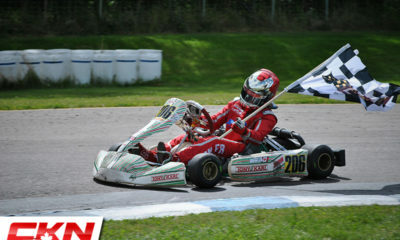 He ruled the kingdom in Rotax Max Masters, sweeping the competition, which earned him the honour of CKN Summer Tour Driver of the Day after scoring two wins in two classes on Saturday. Kwong’s dominance in Max Masters was proven with victories by three seconds on Saturday and a very impressive nine seconds on Sunday. 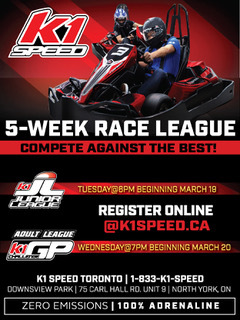 Chris Eagles (Atomica) secured a pair of podium finishes behind Kwong, taking second on Saturday and third on Sunday, which included posting the fastest lap of the race. Saturday’s podium was completed by Erik Gerlof (TonyKart) in third, with Dan Krzesowski (PCR) taking second on Sunday ahead of Eagles. 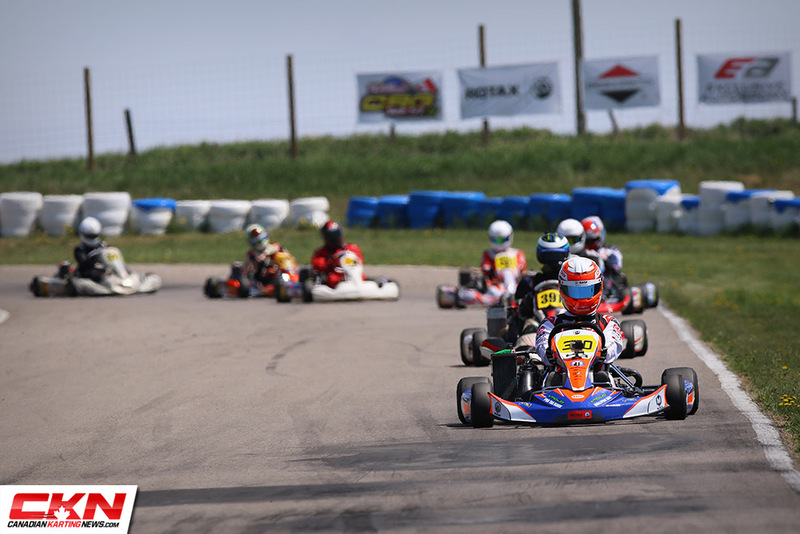 While there isn’t a ticket to the Grand Finals available for the Rotax DD2 racers, a good number still showed up at CKRC for the race weekend and they were partnered up with Open Shifter class on track. Getting out of the starting blocks a little slower than their rival shifters, the DD2s displayed great racing, where Cody Grimes (BirelART) swept both Finals. 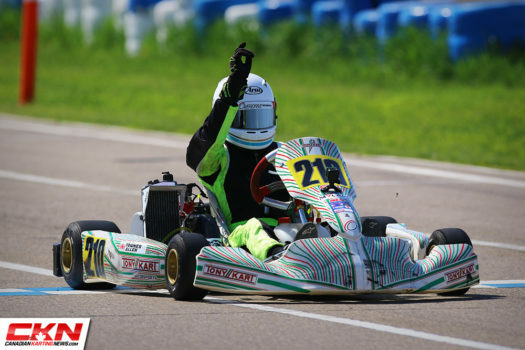 Whitney Stevenson (CRG) and Jared Freeston (TonyKart) came home second and third on Saturday, while Alexis Budel (BirelART) and Kevin Fonagy (Ricciardo Kart) completed Sunday’s podium. 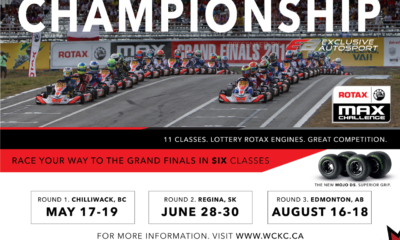 The WCKC championship race to Brazil will continue in just over a months time with round two hitting the track in Saskatoon, Saskatchewan on July 6-8.